First, boots. 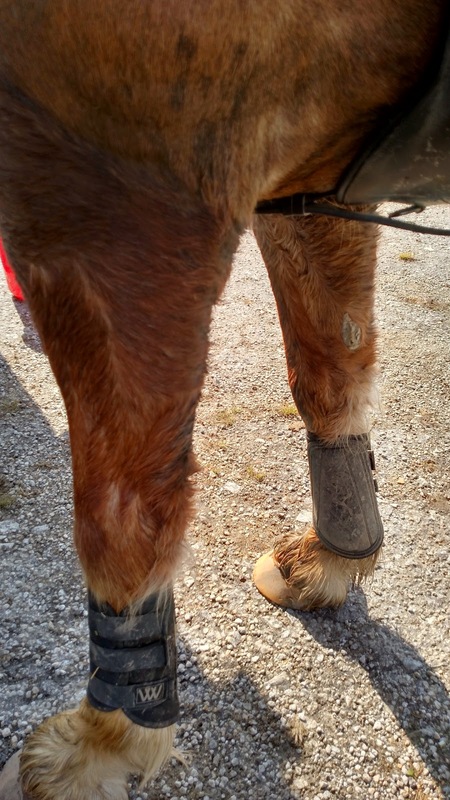 I have lamented my boot woes here before, how he goes in plain three strap neoprene WoofWear fronts because I still haven't found an XC front that is small enough for him in height. On the hinds, he was wearing his Majyk Equipe XC boots. Which I love. A lot. Hinds: I realize the tail got in the way, but they're almost totally dry. I didn't get a picture of this, but the inside of the Majyk Equipe boots were bone dry, and the inside of the WoofWears were still soaking wet after all that time. 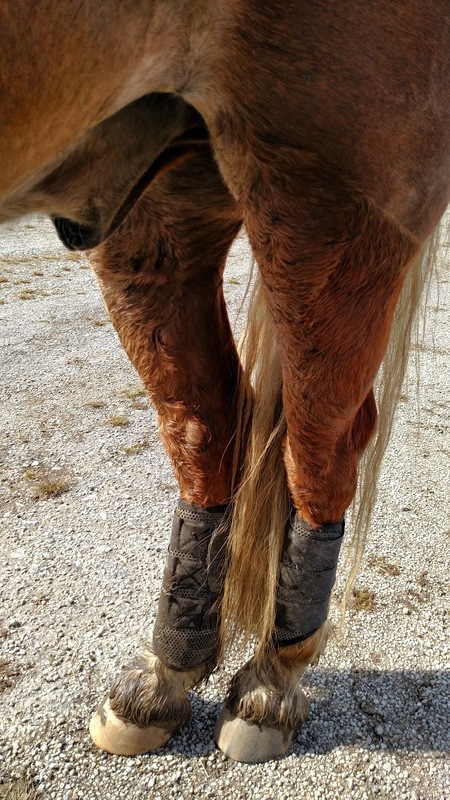 My horse had soaking wet neopene against his skin for two straight hours, and it was hot under those boots too. 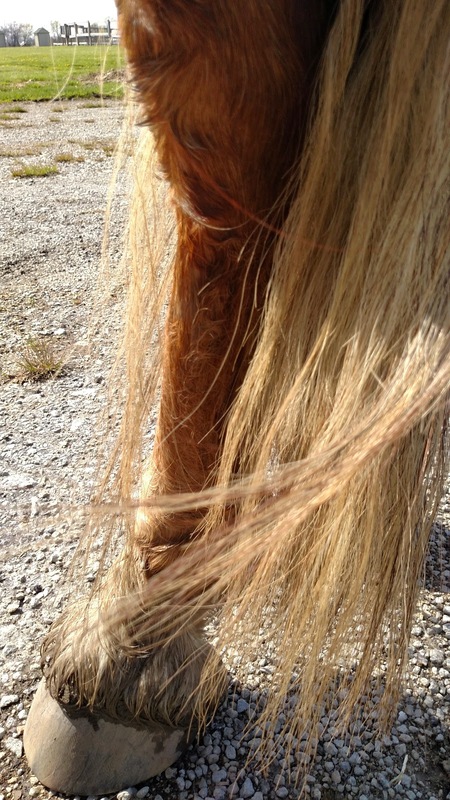 If ever there was an argument against using something soft, squishy and not breathable on my horse, that is it. And on the same subject, I put his Supracor half pad on under my saddle to give him some extra shock absorption, no cover, as well as my Lettia CoolMax pad. Guess what else was bone dry? His back. 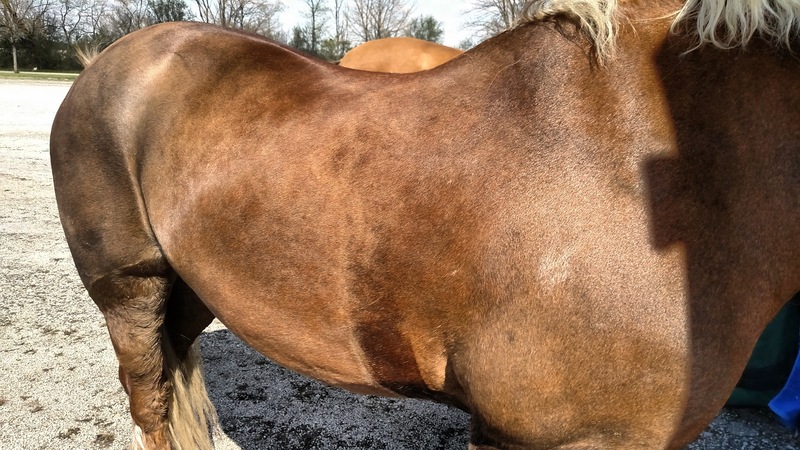 The other horses with various other types of popular half pads definitely had some sweat marks, but aside from his girth, Connor looked like he'd been standing around for the past couple of hours and not schooling cross-country. All in all, I'm happy with the performance of the gear I've consciously chosen (Supracor and Majyk Equipe) and unhappy with the gear I am stuck with due to a lack of alternatives (Woof Wear). 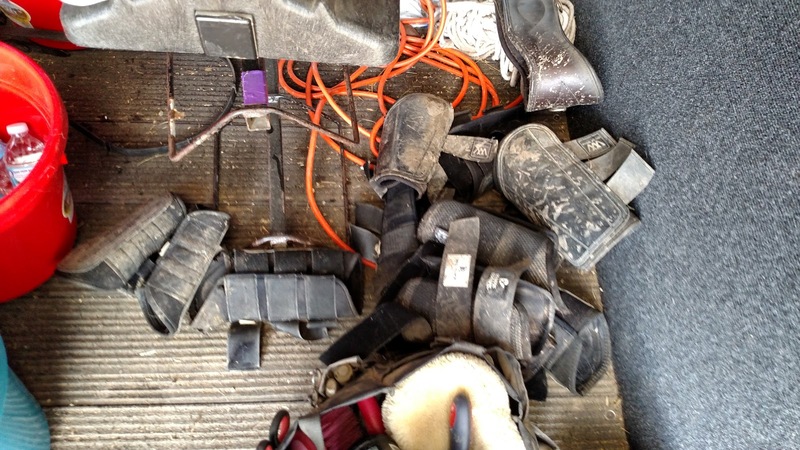 The floor of the trailer after an XC school. Are we eventers or what? Glad you've found gear that works for you! I love the Majyk boots so much. They are really top notch! Ha, great minds think alike, I just drafted a review post about the Majyk XC boots yesterday. Aw man, I wish I would have known, we could have done a joint post! glad you love your gear! i'm so excited to break in my MEs this year!! I am not planning to do any XC this year (or in the near future), but I'll definitely keep ME in mind if/when I need boots. I have a set of their open fronts that I'm quite happy with. They're great. I'm all about keeping heat away from legs while still protecting them well, and they're the sweet spot of both for sure. I'll be curious to hear what you think of it. Supracor is definitely not tack ho trendy, but it's definitely the best out there, again, for heat dissipation and protection, as well as shock absorption. That's a pretty drastic compare and contrast! I wonder how my Equifits would handle the same situation? Not even sure if they make a XC boot. I know, that's why I had to write this post, it was a really dramatic difference! I believe the Equifits are memory foam interiors, so they would probably be closer to the neoprene - but, he's never wearing them for 2.5 hours and going through water complexes in them, so they're totally fine for what you do. I know I would love to have a pair, they're gorgeous! I'm currently looking for open front jumping boots myself. Wow on the boot comparison. I haven't invested in XC boots but it is good to see that the higher cost really does pay off in performance value. Materials make a huge difference for sure. That's the biggest reason I won't use neoprene on any of our horses. Just another argument as to why I need Majyk Equipe boots for XC!! Have you considered EcoGold XC boots? They make a small, are neoprene free and I've found them to be excellent. 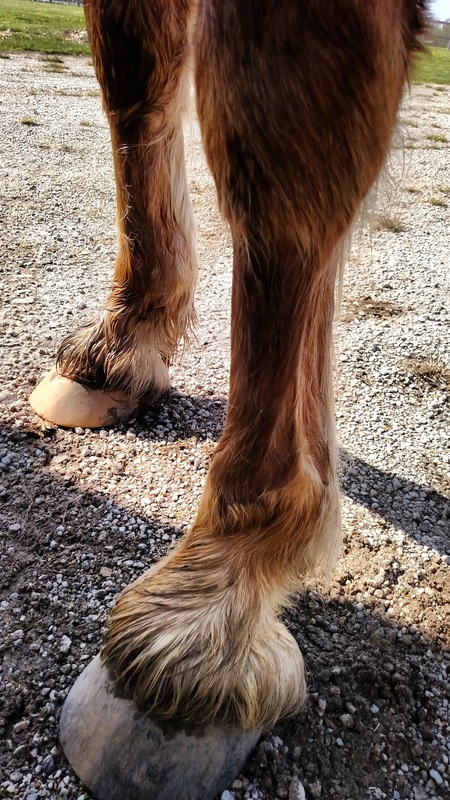 My horse's legs are almost always dry and cool when I pull the boots off. I have not, but I will look into it, thanks for the tip!